During the summer of 2018, some first tests were made to measure the different components of the energy balance of the Blue Green Wave. A radiometer (lent by Kipp & Zonen) measured the net radiation taking into account both short- and long- wave radiation emitted by the atmosphere and the soil. 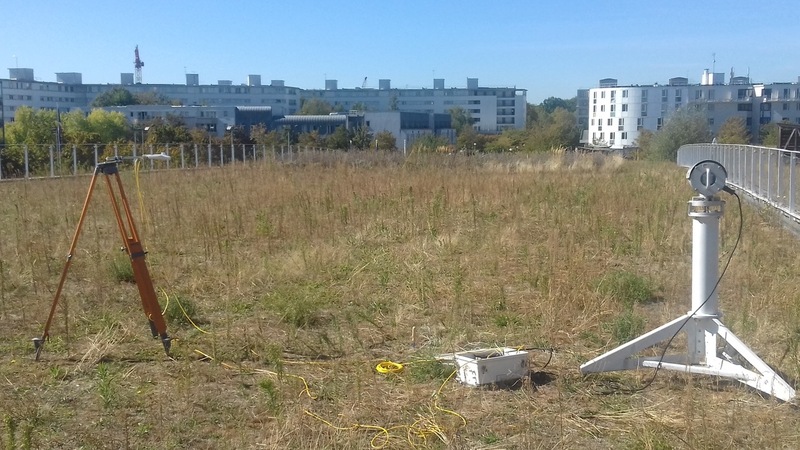 Several temperature sensors were implemented into the soil to assess the soil heat flux and the heat storage variation. Finally a scintillometer was implemented (in collaboration with University of Strasbourg). This device is especially adapted to measure the turbulent sensible heat flux. Combined with the other sensors, it makes possible the estimation of latent heat flux with high resolutions. The latent heat flux, directly linked to evapotranspiration, is particularly relevant as it characterizes the ability of the green infrastructure to cool the air.